But when you stepped through the bails of scratchy tumbleweed that had come to rest against the broken fence you could see the place was held together by nothing more than the debris of its own ruin; the splintered wreck of a life that was hanging on in the middle of nowhere, so its reproach would endure against the Colorado sky like someone who wouldn’t or couldn’t stop crying. I made my choice albeit with some torment. I was a History Boy. Hector [Schama’s English master] took it badly, as if betrayed, and barely spoke to me for months. Many years later I told him that much of the rest of my life had been spent trying to make the choice between history and literature moot. Of course you could interpret this statement as a bashful attempt to justify the defiant, un-historian-like floweriness of Schama’s prose, but – for what it’s worth – the more books I read by Simon Schama, the more I’m impressed by not just his fluency and eloquence as a popular historian, but by the beauty, imagination and emotional insight of his writing. His newest book The American Future, which examines the myriad ways in which America has imagined its own future “from the founding fathers to Barack Obama”, isn’t any kind of departure from his previous output of so-called “narrative history”, and as such is unlikely to convert any of his critics, but it definitely feels more socially relevant than many of his recent publications, which have leant more towards art history than politics (The Power of Art, Rembrandt’s Eyes, Landscape and Memory (which is excellent btw) etc). As if in supplication, one of the cassocked choir would every so often slowly lift both arms, palms upwards, trembling, like a marionette worked by a celestial puppeteer. In the opening chapter ‘America at War’, Schama establishes the dichotomy that he will use throughout the book to analyse various aspects of American history: Jeffersonian vs. Hamiltonian approaches to militarism. Thomas Jefferson favoured a limited army of well-educated specialists trained in engineering and capable of re-building a country’s infrastructure following a war – an army to defend liberty. Alexander Hamilton, by contrast, argued for a larger, more militaristic force – an army to spread liberty. The parallels with modern American approaches to foreign policy aren’t lost on Schama, who at one point describes Mitt Romney as a “neo-liberal Hamiltonian”. The book uses these two radically contrasting approaches to Americana as a spring board to launch investigations into such wide-ranging topics as slavery, irrigation, the compulsory purchase of Cherokee land and national identity – all contained within their own distinct chapters. Naturally some investigations are more successful than others; I found ‘What is an American’ to be a rambling and ungraspable chapter that comes to few conclusions while spreading itself regrettably thin with its examples and sources. ‘American Fervour’, by comparison, is a passionate and moving examination of the role of religion in the lives of slaves, with frequent quotations taken from the ‘Sorrow Songs’ recorded by black army officer Robert Sutton in the 1860s; it stands as a testament to Schama’s emotional conviction that it’s not enough to simply “know” history,but that “we’ve got to understand” it too. Though Jefferson held Jesus in high esteem, as perhaps the greatest of history’s moral teachers, he thought it absurd, if not offensive, to compromise that standing by fairy tales declaring him the Son of God, born of a virgin and such foolishness. […] Jefferson believed that adhesion to unexamined and irrational beliefs had been the greatest cause of contention and slaughter in the world, for there could be no arguing with those who asserted from revelation alone. But later derisions of Jefferson’s personal life and his contradictory attitudes toward slavery build up a complex and multi-dimensional picture of the book’s primary subject: part moralistic, part reviled. This is one of Schama’s more interesting stylistic ticks, and in this respect The American Future really is novelistic: red herrings abound as figures are introduced, praised and set-up as likeable, only to be deconstructed and exposed as bigoted or selfish in subsequent chapters. I found myself, for example, quite taken by manufacturing giant Henry Ford when Schama describes the free schools he established for his migrant workforce and his unwavering dedication to a liveable wage, only to be crushed with disappointment when it’s revealed that Ford also penned the book The International Jew: The World’s Foremost Problem. It’s this up-and-down, wavering and constant re-assessment of his subjects that fuels a lot of anti-Schama criticism from readers who would prefer a more consistent and “objective” approach to history, but I nonetheless enjoyed the complex positioning of the novel, as Schama attempts to present America as very much a frontier nation: not either/or, but filled with contradictions and difficulties. As you’d expect from Simon Schama, The American Future leans distinctly to the left, and as such the book is most interesting when constructing history via the personal struggles of down-trodden masses rather than the political lives of the elite. Chapters are separated by short present-day vignettes describing Schama’s 2008 road trip across America following the Obama campaign, in which he interviews numerous regular Joes in an attempt to gauge not the media or politicians’ reactions to Obama, but the people’s. 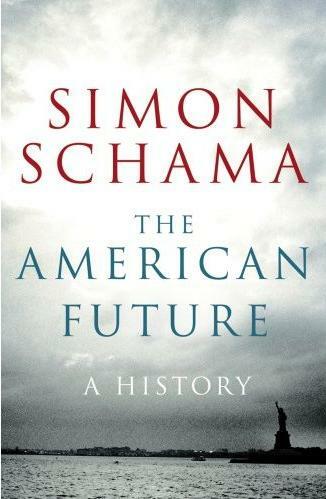 The American Future is a dense, challenging history book made joyously readable by Schama’s narrative approach. It presupposes an understanding of American history that I was unable to bring to the book (I frequently found myself Googling the dates of Presidents’ terms or the specifics of various legislation, for example) and in this regard it suffers from a lack of a comprehensive glossary. Sure it’s a bit of a crash course (after all, who can cover all of American history in 500 pages?!) but if, like me, your reading background is more fiction than non-fiction oriented, then I highly recommend The American Future as both a helpful way-in to American history and an extraordinarily beautiful piece of writing. This entry was posted in Reviews and tagged Simon Schama, The American Future. Bookmark the permalink.